These October days have been the best days of summer so far this year. In all likelihood, we probably did have some nice summer days, but they are crowded out by the memory of one hot, dry day after the next through most of July and August. There are many signs, though, that this is October, not summer. The most obvious sign is the shortened days. Until we "fall back" an hour for the seasonal time change, it is dark in the mornings until well past 7:00 am. It also gets dark earlier each evening. Outside, the leaves of the honey locust blanket the newly planted ground cover bed around its base. The honey locust tree is always the first to lose its leaves each fall. I'll just leave these leaves in place to decay and enrich the soil. 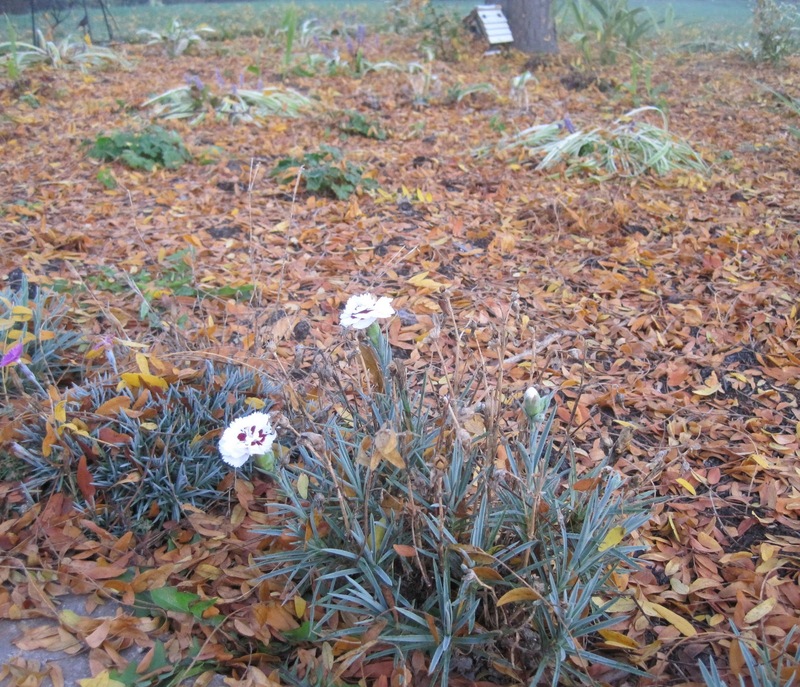 In this same bed one of the toad-lilies is blooming. I just planted it a few weeks ago. 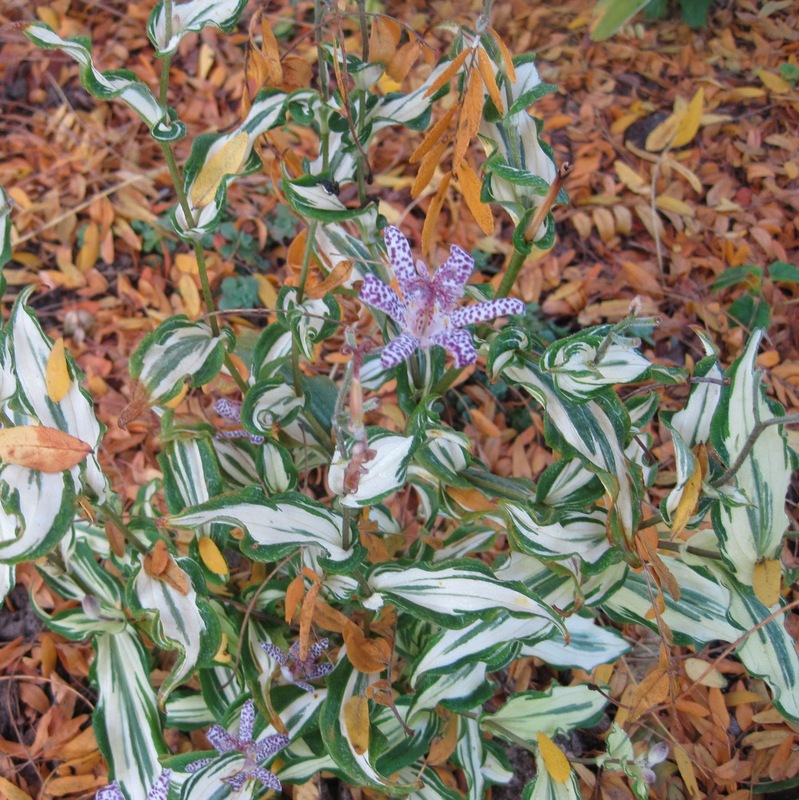 They told me at Soules Garden where I purchased this 'Imperial Banner' toad-lily that it would have foliage that was nearly all green in spring and gradually become more variegated through summer and fall. 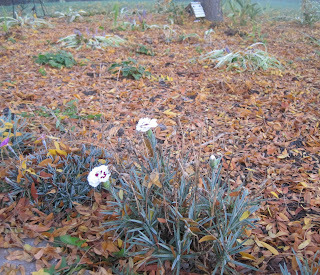 The toad-lilies are usually the last new flowers of the season here in my garden. 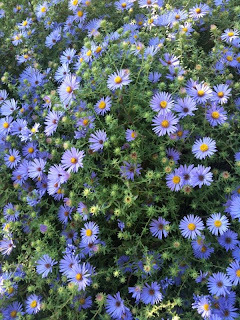 Elsewhere in the back, at the edge of Plopper's Field, my passalong asters are all blooming now, too. 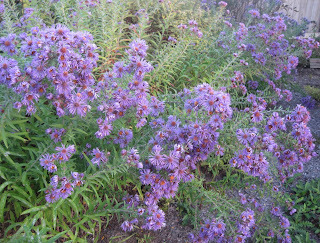 Some people call these Michaelmas daisies because they generally bloom beginning in late September, especially around September 29th, the Feast of St. Michael the Archangel. They are covered with bees and butterflies who know that these nice days will not last forever. I also know that these October summer days will not last forever. I find myself wanting to admire the days away rather than scurry around the garden preparing for winter like the squirrels are doing now. I'll fight that urge to just sit and be, though hopefully there is time for that, too. I'll mow the lawn, which is growing like summer now. Soon I'll be planting bulbs for spring flowers. Two of four bulb orders have already been delivered; the other two orders are surely on their way. 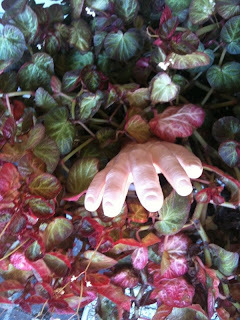 I'll perhaps add some mulch to the flower beds and plant a hand for Halloween. I'm still working on the placement of the hand, but I have a few weeks to get it right. I hope those few weeks are as nice as last week. These October days have been the best days of summer... even though it is fall now. I agree - it's so nice to get out in the garden now that it's cooler! The foliage on the toad lily is awesome. A nice addition to a fall garden! I don't remember seeing that toad lily at Soules! I bought the one with yellow and green variegated foliage. It's been so hot here that I kept it inside until yesterday. It's not much cooler but we have rain. Maybe it will stop missing Indiana so much! What a wonderful descriptions of these perfect days. Thanks, Carol. It is the time to be a gardener. 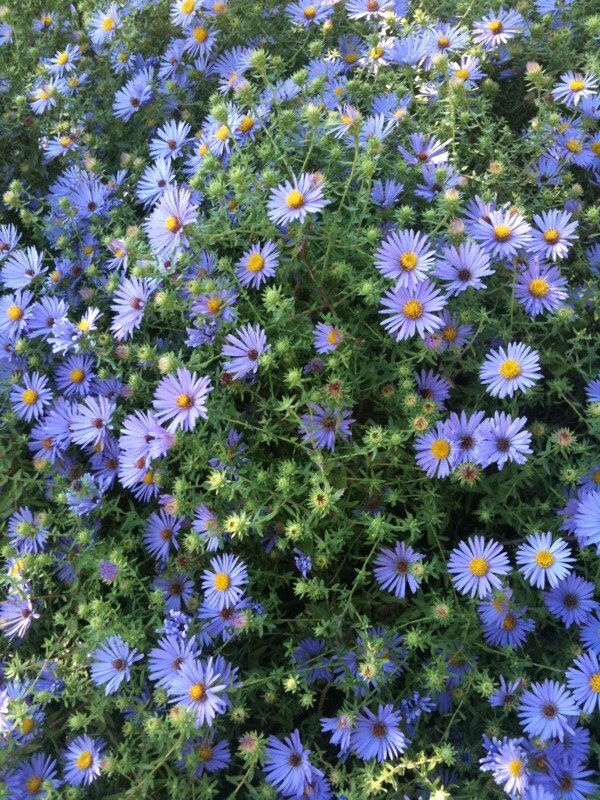 After your summer I am so glad you are getting some beautiful weather and your garden is responding with flowers. I'm glad that you are having some pleasant fall days. We are too, now that it has rained. The weather right now is oh, so pleasant, much nicer than summer. I NEED that toad lily and love your helping hand in the garden. Happy Fall to you! 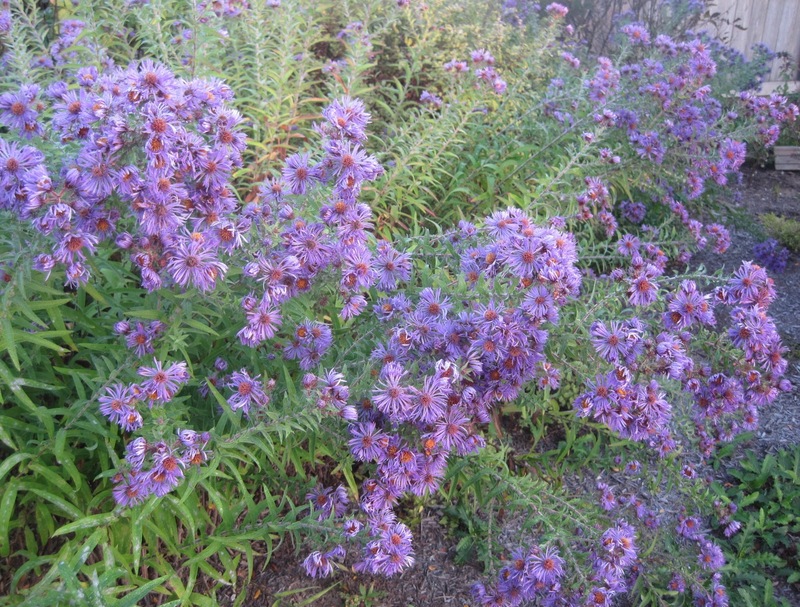 Those 'October Skies' asters are beautiful. I have enjoyed all these days, also.I will miss them when they're gone! This weekend was like an extra gift from the weather fairy. 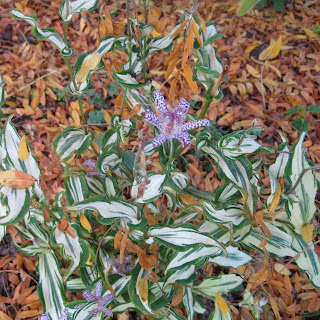 Beautiful foliage on the toad lily; another great bonus.